Not running the Air Force Marathon this year, but still want to be a part of the festivities? If that sounds like you, Air Force marathon officials have a mission for you. Once again the September 15 race is looking for 2,000-plus volunteers to do everything from unwrapping the medals that runners receive at the finish line to post-race clean up. Volunteers do it all and race officials have announced that would-be helpers can start signing up at www.usafmarathon.com. Monaghan also encourages groups to register. In addition to the volunteer positions at the expo, there will also be spots to fill on race day at the Air Force Museum and at the 5K event at Wright State University. Bands are also needed to provide entertainment for the runners along the course on race day, according to the press release. All of the positions are listed on the marathon’s website. For your hard work you’ll walk away from the experience with a little swag. 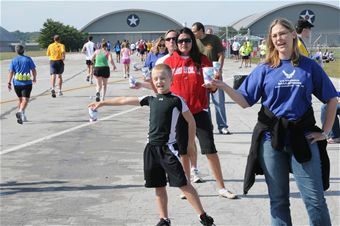 All volunteers receive an Air Force Marathon T-shirt.